« Affordable Burnaby Sequel on Royal Oak Condos from $269,900! Royal Oak Burnaby Apartments for Sale near Metrotown and Parks! OWN a premium Vancouver downtown condo in the Entertainment District! These affordable Vancouver ONE PACIFIC condos are now previewing with presales starting right now! Just one block to the Seawall, marina, the waterfront district and Cooper’s Park, the One Pacific Vancouver downtown condos gives you a premier location close to everything you want to see and do. 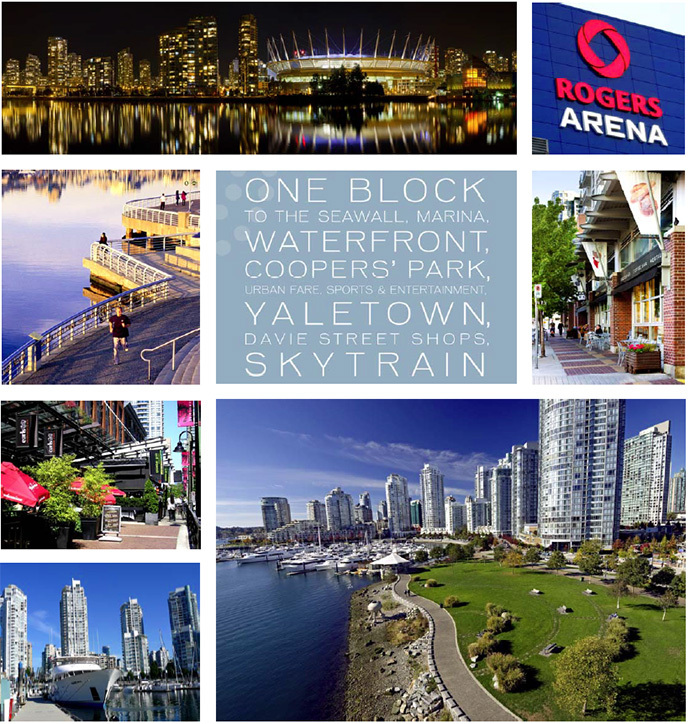 This transit oriented downtown Vancouver condo community is also within walking distance to Urban Fare, Yaletown, Midtown, the sports and entertainment venues at Rogers Arena and BC Place Stadium in addition to Davie Street shopping and dining and the Sky Train system. Enjoy premium views of the waterfront, marina or the Riviera Deck with pricing starting from the low $300’s. This is Concord Pacific’s most luxurious development in Downtown Vancouver, and we believe that it’s one of the best projects of 2013! This incredible One Pacific Vancouver condo presales will also present affordable pricing for the area with 1 bedrooms starting from the low $300’s and 2 bedroom starting from just under $500,000. There is underground parking and storage lockers at additional costs. 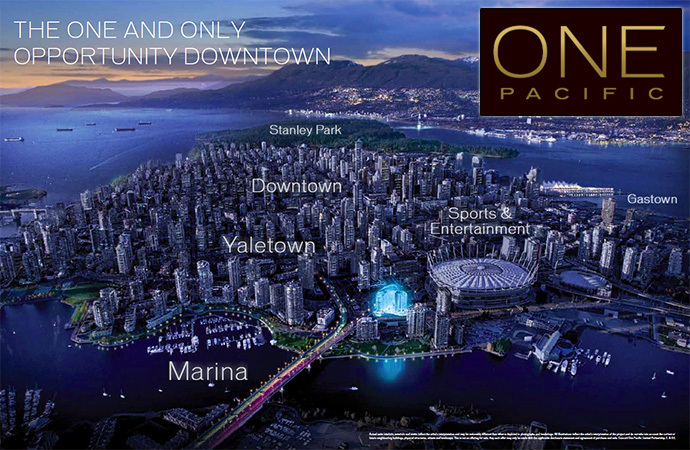 Phase 1 release at ONE PACIFIC Vancouver downtown condos is coming May 2013. Register online at liveonepacific.com or you can register with us on this page for more details. The One Pacific 1 bedroom and flex floor plans are between 505 to 548 square feet while the 1 bedroom plus enclosed balcony plus flex space are around 562 square feet. The 2 bedrooms at One Pacific Vancouver condo presales are between 783 sqft and 1093 sqft and they have flex space and/or enclosed balconies as well. There are over 30 One Pacific floor plans to choose from in Phase 1. 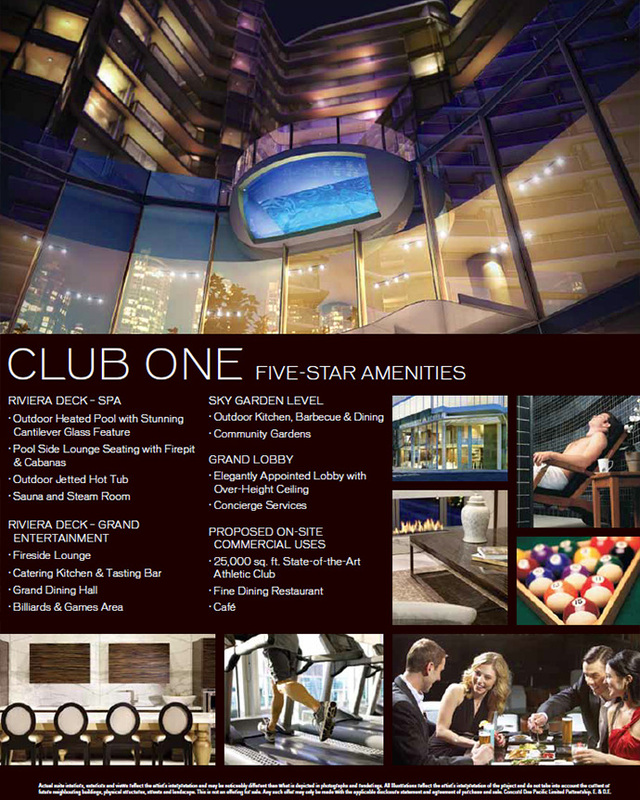 One of the most impressive on site amenities at CLUB ONE at ONE PACIFIC Vancouver presale condos is the Riviera Deck Spa and Grand Entertainment centre. The Riviera Deck Spa at Club One ONE PACIFIC amenities space includes an outdoor heated swimming pool with a stunning cantilever glass feature in addition to a pool side lounge seating with fire pit and cabanas. The Club One Riviera Deck Spa at ONE PACIFIC Vancouver presale condos also include a sauna and steam room in addition to an outdoor jetted hot tub. 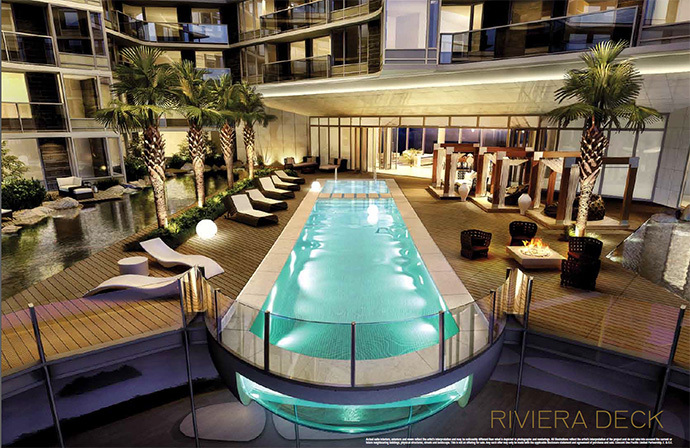 The Club One Riviera Deck Grand Entertainment centre will include a fireside lounge, billiards/games area, grand dining hall and a catering kitchen with a tasting bar for all of your entertainment needs. The five star amenities at Club One at ONE PACIFIC Vancouver presale condos continues on the Sky Garden Level where residents can enjoy an outdoor kitchen, barbeque and dining area as well as community garden plots. The grand lobby at ONE PACIFIC Vancouver downtown condo towers will be elegantly appointed with over height ceilings, comfortable seating areas and a full time concierge desk. Also, the proposed on site commercial amenities will include a 25,000 square feet state of the art fitness centre/Athletic club a fine dining international café and restaurant. These are the impressive 5 star amenities at the downtown Vancouver ONE PACIFIC Club One amenity spaces that are available exclusively to home owners and residents in these towers. The smart finishes at ONE PACIFIC Vancouver condos include four interior colour schemes and most suite floor plans have open air balconies or terraces that expand your interior living outwards. In addition, the One Pacific Smart condo features include wide plank laminate wood floors in the main living areas and flex spaces in addition to carpeting in the bedrooms, on stairs and upper level of the One Pacific Penthouse units. All homes will come with air conditioning in addition to ceiling heights at approx. 8 feet and six inches depending on the level and suite. All homes at the downtown Vancouver One Pacific SMART condos will include stacked front loading washer and dryer in addition to pre-wiring for telephone and TV. There are closet organizers, roller shade privacy coverings and porcelain tiled flooring in the laundry closet. The ensuite or main bath at the One Pacific SMART Vancouver condos will include laminate vanity with soft close door and slide out drawers, engineered quartz stone counters, custom medicine caginetry, polished chrome Kohler faucet, dual flush toilet and shower rod. In addition, there are large format porcelain tiled flooring and tub/shower surrounds. The 2nd bathrooms (wherever applicable) have walk in showers, mosaic marble tiled shower flooring and polished chrome Kohler shower heads in addition to a walk in full length shower stall with partially enclosed frameless glass as per plan. The kitchens at the new Vancouver One Pacific Smart features include laminate cabinetry with open glass display shelves and under cabinetry valance lighting. There are soft close drawers, magic corners and waste recycling bin and sliding basket under the sink. 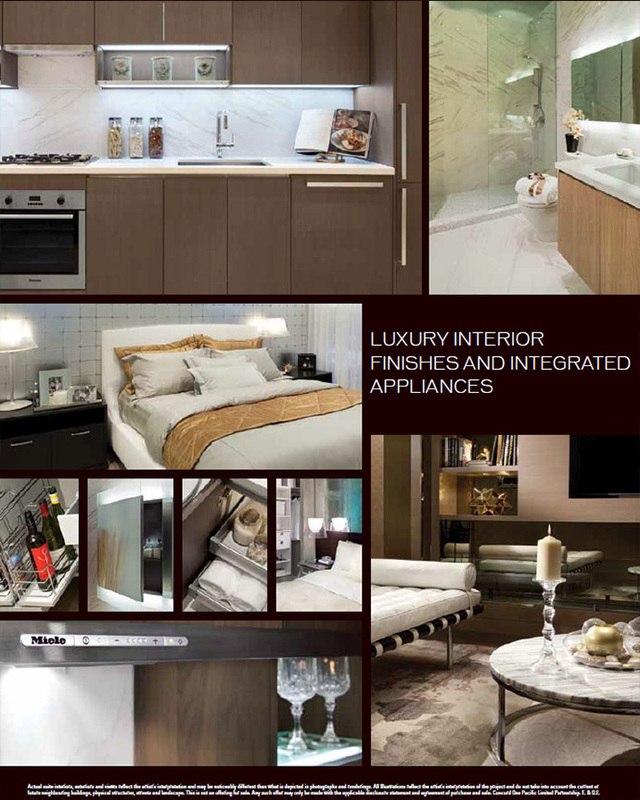 The Smart One Pacific condos will also have integrated stainless steel appliance package with bottom mount counter depth fridge with integrated panel, hood fan, dishwasher with integrated panel, gas cook top, wall oven and microwave installed with trim kit. In addition, the kitchens at the new Vancouver One Pacific Smart condos will include polished chrome Kohler faucet with lever handle and pull down spray, track or pot lights and engineered quartz stone counters. The new Downtown Vancouver condos at One Pacific also introduce premium finishes that include the following. Again, there are 4 designer colour palettes and finishing palettes to choose from, a combination of bedroom carpeting and living space wide plank engineered floors in addition to marble tiled laundry closets. Other premium features at One Pacific Vancouver Downtown condos for sale include wood veneer vanity with soft close door and slide out drawers, engineered quartz counters, under mount sink, custom medicine cabinet with mirror, shelves and built in lighting and marble tiled flooring and tub/shower surround. Other bathroom features at the One Pacific Vancouver premium finishes include a dual flush toilet and polished chrome Kohler faucet, tub spout and shower head. The premium features at One Pacific Vancouver condos include an integrated stainless steel appliance package by Miele that includes a counter depth fridge, hood fan, dishwasher, gas cook top, wall oven and a stainless steel microwave installed with trim kit. Other premium features include large single bowl stainless steel under mount sink and cabinets with soft close hardware. The other premium finishing is wood veneer cabinetry with open glass display shelves and under cabinetry lights.